PLEASE HELP A SOCIALIST LABOUR PARTY GET INTO POWER IN THE UK – REGISTER TO VOTE NOW! The British Labour Party abandoned Socialism and the working class in the 1990’s when it elected the rightwing Tony Blair as its leader – who instigated a vicious rightwing tirade against the people who elected him into a landslide victory in the 1997 General Election. Leading up to the election, Tony Blair utilised the agency of ‘spin’ to give the false impression that he was a ‘modern’ Socialist who had the nation’s best interests at heart – when in fact he was a neo-conservative whose privileged historical background had links to the true leftwing Labour Party. He was brought up in the terrible era of Margaret Thatcher‘s rightwing draconian policies that destroyed nationalised industries, cut welfare, and began the process of privatising the NHS. Millions were unemployed and starving under her tyrannical leadership of the country, but Tony Blair did not see things this way. Indeed, when looking back at her life, Margaret Thatcher stated that her greatest accomplishment was not the crushing of the Unions, or the dismantling of British Socialism, but rather the creation of Tony Blair. Tony Blair not only reveres Thatcher – but is on record as describing her notoriously racist conservative colleague Enoch Powell as a ‘great person’. This is the Tony Blair that propelled himself to power in the Labour Party after the death of the popular Labour Leader – John Smith in 1994 – the last truly Socialist Labour Leader until recent events. It is difficult to conceive how a British Labour Party ruled the UK from 1997 – 2013, and not reverse any Thatcherite policy. 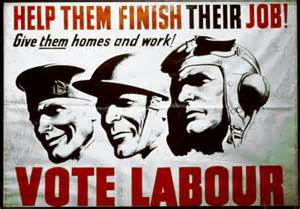 In fact, Blair and his Labour cronies continued the conservative policy of cutting welfare, social services, and the NHS – everything the great Socialist Labour Party had brought into being following their 1945 General Election victory – a victory premised upon the moral right to assist the returning working class men (and their families) after their service in the British military during WWII. The Labour Party today is a party of big businesses and corporations. It is a carbon-copy of the Conservative Party that sells its policies to the highest bidder. Big business is essentially a middle class affair, whereby these greedy individuals are always looking for better ways to cheat their work forces, and cheaper ways of employing them. It can be seen just how far the Labour Party has gone ‘through the looking glass’ by the fact that it considers the bourgeois Richard Branson a supporter! No, the working class no longer have any direct say in how the upper echelons of the Labour Party operate, and no input toward Labour Party policy, because if it did, the anti-Union laws would be repealed, and sound working class policies would be enacted, such comprehensive welfare, free education, free social housing, and the maximisation of the NHS and the banning of all private health and other disruptive private enterprise. This would naturally follow after the nationalisation of all the county’s utilities and services. A colleague of mine worked for the now defunked Audit Commission as a Benefits Inspector. Her job was to investigate Local Councils and check whether they were applying government policy correctly. In 2009, along with many other Audit Commission employees, my colleague attended a meeting in London with a New Labour government minister. He stated that it was the intention of New Labour to dismantle the Welfare State and get people back into work – this included the previously exempt category of ‘Disabled’. He continued that if everyone in the UK was in work, then they could afford private healthcare cover – and so New Labour was going to privatise the National Health Service (NHS). All of this was going to be done over the next 15 years, and in the end, the only people who would receive even a meagre Benefit hand-out, would be the multiply handicapped or terminally ill. He further stated that the Disabled will no longer be protected under UK Law as a separate category to able-bodied Benefit recipients, and will be subjected to harsh Benefit applications, assessments, and punitive actions. This minister stated that the New Labour Party wanted to use the Audit Commission as a central means to implement all these cuts and reforms. Although Labour lost the 2010 General Election, it is interesting to see how the Conservatives and Libdems have pursued exactly this New Labour policy in more or less the same allotted time span. Of course, this raises questions about who exactly controls the UK government, and whether our national assumption that our governmental structure is truly ‘democratic’ is correct. From where I am standing, it certainly looks like an over-arching power is running things behind the scenes and that voting every 5 years is nothing but a sham. The reason why Jeremy Corbyn may well lose the next General Election has nothing to do with Socialism being dead or outdated. Currently in the UK, only 1 in 5 of the total number of people who could vote, are actually registering to vote. This means that our General Elections are decided by a tiny minority of just around 20% – as was the last one. The other 80% comprise the bulk of the disillusioned working class who live on housing estates, and who suffer all the consequences of the cuts. As they are not registered to vote, they are excluded from the very process that is inflicting pain, suffering, and death upon them. They feel so alienated from the political process – which they perceive as ‘middle class’ and therefore nothing to do with them – that they refuse to engage in it due to its discriminatory nature at the point of contact. This being the case, and bearing in-mind that the New Labour Party has abandoned the working class – the Blairites are thinking that if they just leave Corbyn to his own devices, working class apathy will do the rest. This is because the 20% who do register to vote are either middle class people protecting their conservative values, or upper working class people who mistakenly perceive themselves as ‘conservative’ and vote accordingly. The point is that Corbyn is not going to secure a majority in the House of Commons on a Socialist ticket by relying on the usual 20% of the electorate who have already shown their true colours by returning a far-right Tory government to power after its policies murdered around 10,000 Disabled people during its last stint in office. For Jeremy Corbyn to win the next UK General Election, the Labour Party has to abandon big business politics, and initiate a campaign to get the other 80% of potential voters to a) register to vote, and b) actually vote Labour. If this is not done, Corbyn will lose the next General Election, and the cause of Socialism in the Labour Party (and the UK) will be virtually finished for good. This will condemn the originally leftwing Labour Movement to being a slightly more moderate version of the rightwing Tory Party.